← Week 9 – green beans! We finally took a picture of the darn share this week (photo credit Della! 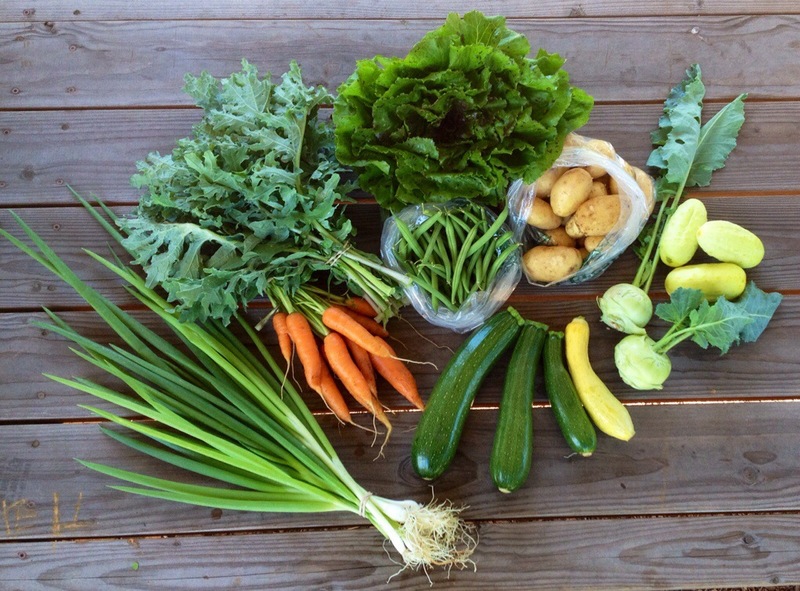 ): You’ve got green onions, potatoes, carrots, kohlrabi, zucchini and yellow summer squash, either Boothby’s Blonde or Diva slicing cucumbers, green beans, White Russian kale, and a head of lettuce. The spuds are the new exciting addition this week. These are ‘new potatoes’ meaning that their skins have not hardened or cured yet, so they fall off easily and won’t store for too long like cured taters. So use them fairly quickly. Ideal storage is in a paper bag in a cool (not cold) place like a basement. Potatoes kept in the fridge convert their starches to sugar more quickly, which affects their flavor, texture, and cooking…. though if you have no other cool place, the fridge will do. These spuds are the variety “Carola” — with sweet yellow flesh good for baking and frying. They are similar to Yukon Gold. Here is a shot of the potato beds I dug for you yesterday with the broadfork. 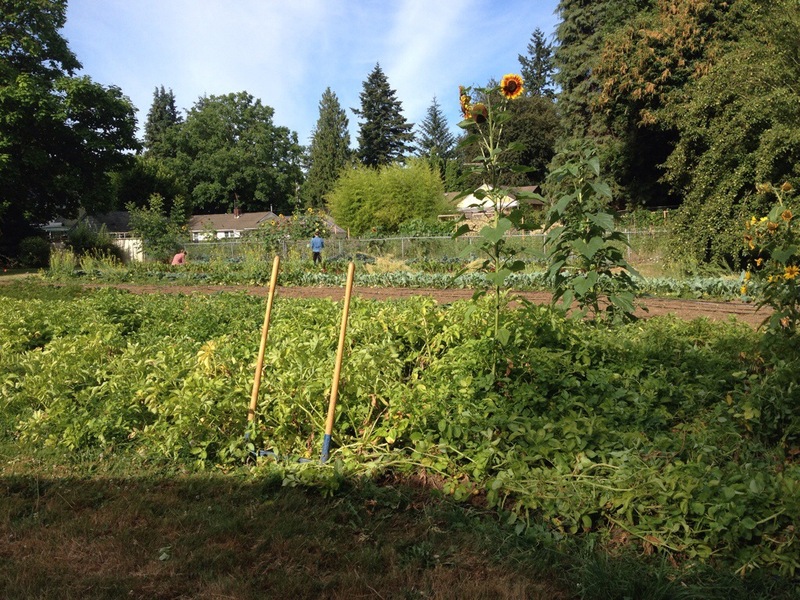 Della and Michael are harvesting kale in the background… All right and now for some recipes, thanks to Della again! * Adding one of your many zucchinis to these might be tasty too! Cut the leaves off of the kohlrabi, and peel the bulb. Peel the carrot. Shred the vegetables in a food processor (quick and easy!) or using a grater (slow method). Squeeze the shredded vegetables in a tea cloth (or with your hands) to remove moisture, then add to a bowl with 1 egg, ¼ teaspoon kosher salt, ¼ teaspoon cayenne, and mix to combine. Serve fritters with avocado cream sauce and sliced green onions, if desired. 1. Preheat oven to 350° F. Get a pot of water boiling large enough to accommodate the potatoes. Also prepare an ice bath. 2. Meanwhile, slice the potatoes 1/4-inch-thick. Set aside. Remove and discard the spines from the kale then chop the remaining leaves in 1/2-inch-thick ribbons by stacking the leaves and slicing in the direction of the veins. This doesn’t need to be exact, as long as you end up with a pile of roughly 1/2-inch-thick shreds of kale. 3. When the water is boiling, add a dash of salt and gently drop in the potatoes, cooking for about 2 to 3 minutes, until tender, but not cooked through. Drain and plunge into the ice bath. Drain again and dump onto a dishtowel and blot. 4. In a large bowl, combine the olive oil, garlic, salt and pepper. Add the kale and rub the olive oil mixture aggressively into the leaves. Layer the kale and potatoes alternately with a sprinkling of breadcrumbs and Parmesan in a 9″x12″ rectangular casserole or glass or ceramic baking dish. Cover with foil and bake for 30 minutes. Remove foil and bake another 15 minutes, until top is crispy.